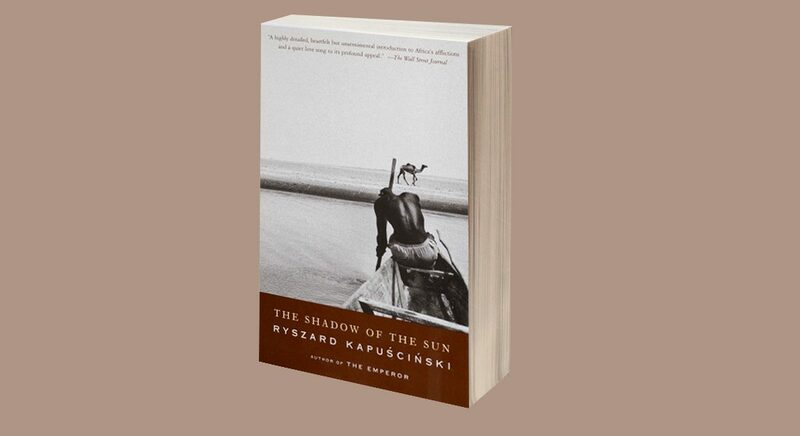 The Shadow of the Sun narrates the experiences of the Polish journalist, Ryszard Kapuscinski in Africa. Kapuscinski lives in Africa not as a ‘happy tourist’, but rather as a daring reporter who gets himself into all sorts of situations on his search for an interesting experience. He never travels first class, nor does he sleep in hotels, nor does he drink liquor or swim in pools. In fact, Kapuscinski acts as though he is a real run-of-the-mill African. Thanks to his boldness, we get to feel the heartbeat of Africa. A continent where unfortunately there are several common denominators that are tainted by misfortune: poverty and wars (lots of coup d’états). But it would be unfair to oversimplify things. There is more to Africa, much more. For instance, it is true that there is witchcraft, superstition (the dead are buried nearby the living who seek protection) cockroaches over ten centimetres long, TB, darkness, and disturbing mysteries but there is also music and joy. In sum, as Kapuscinski affirms, it is impossible to define this continent in one single breath. We are dealing with a mosaic of contrasts, or lives, of diversities… “In reality, except as a geographical appellation, Africa does not exist,” states the Polish writer in the prologue. Summing up the experiences of Kapuscinski in The Shadow of the Sun, the readers will remember many incidences: the time when the reporter meets rather peculiar ministers in Ghana, the time when he is robbed in Lagos to the sound of a coup d’état, the civil war in Liberia, the amount of arms he sees circulating right before his very eyes, the time when he is almost run over by an elephant in Tanzania, famine in Ethiopia and Eritrea, his routes through Cameroon or along the river Niger, the war of Sudan’s Islamic government against the rebel south, his in situ verification of “social promotion” of blacks in Senegal, his research on the genocide in Rwanda, which had been provoked by the Belgians and the French… and of course, the heat, the stifling heat. Needless to say that today Kapuscinski is considered an eminence among African experts. Undoubtedly, his masterpiece, The Shadow of the Sun, decisively contributed to acquiring that prestige and helped in bringing the African world closer to many readers. Shadow of the Sun is a mandatory classic for anyone who wants to learn about Africa. Having said this, it is also worth highlighting that for those of us who have lived in Africa, perhaps Kapuscinski focuses too much on conflicts and on the negative aspects that make it into newspapers and dramatic reports to boost their sales. Indeed, Africa is much more than just war, corruption and problems, although it is fair to say that Kapuscinski also speaks of Africa’s virtues. The book (it cannot be considered a novel, it is more so a report) works because it is well constructed: the common threads are very well connected. That is the key. To this we add how interesting the subject matter is and the intensity of the writer’s experiences and The Shadow of the Sun soon turns into the classic that it is today. I randomly came across Kapuscinski, got this book not long ago…thanks for remining me to read it and keep up with the fun writing you are doing here…thanks for sharing familiar thoughts feelings and experiences from mama Lib! Thanks, Dea. It’s great you are enjoying the blog. All the best!